I have a big family on my mom’s side. If we are all in attendance it is well over 50 people. When we get together we always do potlucks, pitch-ins, a dish to pass, covered dishes…what do you call it? Basically we all bring a side dish or a dessert to share with everyone else. There are a few staples that need to be at our family gatherings or I am disappointed, namely Broccoli Salad, Strawberry Pretzel Dessert, and Oreo balls. 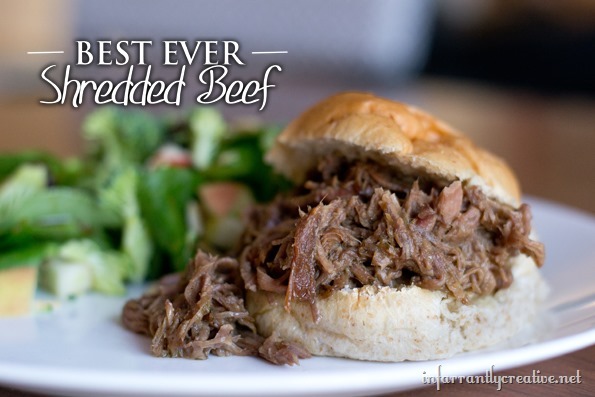 Recently this beef made with giardiniera sauce is quickly becoming a family fave as well.